Indians Baseball Cards: 2013 Pre-Season Pack Busting! Hey folks! Thanks for coming along and joining me in busting open a pack of cards as a "Pre-Season warm-up!" Like last season, I plan to open at least one pack of cards for each day of the 2013 MLB season. And, like last year, I am opening a pack each day whether or not any games are played that day. Participants receive ALL the cards of their drafted player(s). Cards featuring more than one player will be given to the participant who previously drafted a pictured player, if appropriate. If more than one pictured player has already been drafted by more than one participant or if none of the pictured players have already been drafted, they will be added to a multiplayer pile. I am still working on how to dole those out. This includes team cards where the manager is *NOT* inset. On team cards featuring an inset manager (that is, the manager has his own photo displayed separately from the rest of the team, and it is obviously separated), the card goes to the person who selected that manager. If no one selected that manager, the manager's name is added to the "Free Agent" list. Any players revealed during the breaks who are unclaimed will be added to the "Free Agent" list. "Free Agent" players will be collected throughout each week. There will be a form developed from which participants will be allowed to select any of the available free agent players they wish to try and claim. The form will be opened from late Friday evenings until roughly 9 pm CST on Sunday nights of each week. I will run a standard, non-collapsing snake draft to hand out players. As players are added to each participant's roster, that participant gets ALL the cards of those added players on their roster. That means if you selected "Jack Smith" in the free agency draft and won Jack Smith in the free agency draft, you would get EVERY Jack Smith card since the giveaway began and every card revealed until the season is over! Any unsigned players at the end of the season will be put into a pile to be distributed as evenly as possible between all the participants. So, if Bobby Johnson goes unclaimed, all of his cards would go into the pile and then be distributed among as many participants as possible. Any scans of the cards will appear at or near the bottom of the post to keep things cleaner-looking. I will generally keep scans limited to 9 cards at a time (that is how many usually fit on my scanner in one shot). If anyone has a specific card they want to see, I will try to accommodate you. Other rules/guidelines will be added as needed. I think that covers it. Now, let's bust some wax! 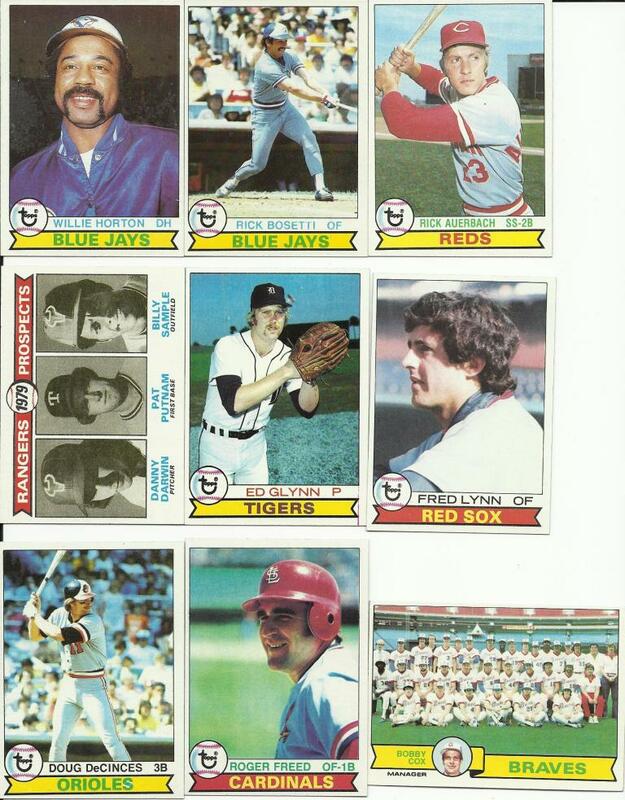 To kick things off, I cannot believe that the first pack out of the "Big Ol' Box O' Cards" is a pack of 1979 Topps! Now, you may remember that I mentioned in another post that this pack looks "too unopened" for my liking. If you aren't familiar with this, let me elaborate. In the "old days," wax packs really did have a wax coating on them. Unscrupulous dealers could easily open the pack, pilfer through it, swap out the cards they wanted to keep with commons and then easily reseal the pack by heating the wax. Frankly, that's what this looks like. I wish I had thought to scan in the pack before busting it, but I am just too doggone anxious! Well, that was a bit surprising in a way. Only ONE of the cards actually went to a participant off the bat. Since Cox is depicted as an inset on the card, it goes to dayf13. That worked out well as an object lesson, eh! In the meantime, we have a slew of players that will be added to next Friday's (the first OFFICIAL) Free Agency Draft List! In the case of the Prospects Card, I will add EACH NAME as a separate player up for grabs. Fun opening - and I learned about resealed packs. So where is this FA form so I can put Fred Lynn on it? The form will be available Friday and will include pre-season and regular season breaks for the week. WooHoo! My favorite daily feature in the blogosphere is back! David, you are the man! Quick question for you: is your "Big Ol' Box O' Cards" full enough? I would love to send you a cornucopia of packaged cardboard to help you get through the season. Send me an e-mail with your addy if interested! Tom, I am always glad to receive packs for the giveaways! I can certainly use some if you'd like to add some to the cause. :-) I'll send you my address. Thanks! And, dayf, yes. Yes you are!